Cherokee Workwear will always be "Built for Lasting Comfort"
Beautiful, flattering & affordable for all individuals. Perfect scrubs for group orders! One of the most popular Greys scrub tops! This traditional 2 Pocket mock wrap top has been a top seller for the last few years. Designed for anyone in the medical & dental field! 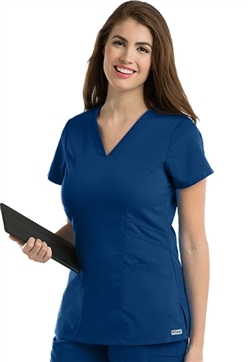 This fabric features arclux technology that you can't find in any other scrubs. You will look professional and experience unbelievable comfort in your Grey's Anatomy Scrubs! It's time to change up your uniform with this cute NEW Grey's Anatomy scrub top! This trendy top features incredible softness and flexibility that will keep you cool and comfortable all day.